Books have the power to change how we think and behave. Charles Darwin’sOn the Origin of Species laid the foundation for evolutionary biology 153 years ago. In 1962, the book Silent Spring by Rachel Carson sparked the modern-day environmental movement. And in a more focused way, 1998’s The 12 Principles of Green Chemistry by co-authors by John Warner and Paul Anastas gave momentum to the idea that the chemicals we rely on for manufacturing “stuff” don’t have to be toxic cocktails that threaten our health and environment. Anastas, who first coined the term “green chemistry” in 1991, was at the time a staff chemist at the U.S. Environmental Protection Agency. Warner was an industrial chemist at Polaroid trying to get regulatory approval for a new low-impact chemical manufacturing process the EPA didn’t really understand. The two men found themselves allies in an effort to push a concept that was largely foreign to the teachings of chemistry: to make materials in an environmentally benign and responsible way, rather than tolerate harmful side effects. 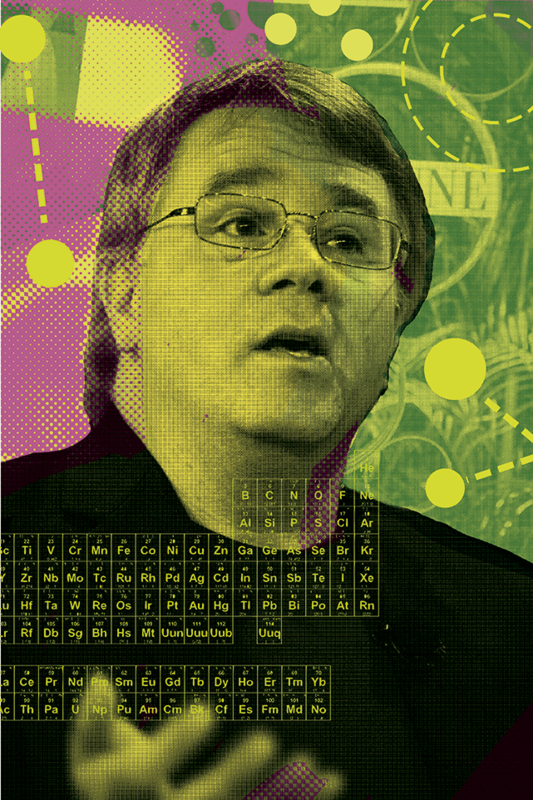 Warner is now president and chief technology officer at the Warner Babcock Institute for Green Chemistry, an organization he founded in 2007 that is “dedicated to the development of non-toxic, environmentally benign and sustainable technological solutions for society.” Corporate Knights had an opportunity to chat with Warner about the field of green chemistry and why it’s so important. CK: You are often referred to as one of the founding fathers of green chemistry. What’s behind that reference? WARNER: I was working at Polaroid for 10 years and while there invented a technology (for a benign manufacturing process). I went to the Environmental Protection Agency to go through all the regulatory hurdles and I was having a hard time getting it through. Not because of anything to do with toxicity or environmental impact. It was just different. I found it ironic that the (existing) process we were using used some questionable, nasty stuff and here was a new technology that was head and shoulders better and the EPA was making it more difficult to do new things than continue to do old things. Everyone (at the time) was talking about measuring, monitoring, characterizing, remediating, recycling and dealing with hazardous materials after they’re in commerce, and here I was, a synthetic organic chemist, inventing something that is better in the first place. And although that seemed so obvious and straightforward, there was no language for it. There was no science to actually contemplate that. CK: Can you explain that last comment, that “There was no science to actually contemplate that”? WARNER: The way science grows is to be communicated, so we create a little pocket of knowledge, we give it a name and we start talking about it in journals and conferences. In 1990, there was no such thing as people communicating how to invent things that are benign in the first place. Everything about pollution was how to deal with it after the fact. The point of “green chemistry” was to come up with a science to grow a body of knowledge so that as we progressed in the future, it would be part of the lexicon of science. CK: This must have been frustrating at the time. WARNER: I really got discontent about this. I started looking around and I realized that not one college, not one university on the planet trained scientists who make things to identify what makes them toxic. Doctors, lawyers, teachers, nurses, architects, engineers; all these professions have to take a test to get a licence and in a few years have to take a test to maintain a licence. My father was an electrician. He couldn’t come to your house and change a light bulb without a document saying he could do it safely. And yet, anyone can take a molecule that has never existed in the universe before – potentially making the most potent neurotoxin in history and nowhere in their education did they get any kind of training to anticipate that. We’re starting to make progress, but it is slow coming. CK: What you developed at Polaroid you described as a “benign” approach to manufacturing, and in our discussion you’ve compared it to biomimicry – copying how nature does things. Can you explain the connection between the two? WARNER: Humans have been at chemistry for 150 years. If you look at the molecules in our drugs and our cosmetics and our electronics, it’s breathtaking. We are so amazing, we should pat our backs at just how cool are the things we have done. But if you look at our manufacturing processes, we use high temperature, we use high pressure, we use nasty reagents to do all this stuff. Now, if you look at nature, and you look at the molecules in nature, we have to react with a great deal of humility. Nature outperforms us in the diversity and complexity of structures it makes. But not only is nature better from that perspective, it does everything at room temperature, it does everything at ambient pressure, and for the most part water is the solvent. Humans force molecules to do what we want them to do, whereas nature asks molecules, “What do you want to do?” and builds the system around that. At Polaroid I looked at manufacturing processes and asked myself, “Can I put two molecules together that help each other so that together they will do things at room temperature and ambient pressure?” That was the stunning success. But because it was so freaky and weird, the EPA didn’t know what to do with it. CK: Is curriculum heading in the right direction? WARNER: I’d say well over 70 per cent of the colleges and universities in the United States have faculties passionate about green chemistry and trying to bring it into the curriculum. But I don’t see any colleges or universities at the department level that have embraced it as part of the required curriculum. Now, if a student wants to know this, it’s becoming easier and easier for them to learn it, but I think that’s missing the point. What aspect of chemical education could be more important than this – how to keep people safe and not make toxic materials? But changing curriculum is a challenge. CK: You have mentioned that most of the big companies are embracing green chemistry to a certain extent, but who would you say are the leaders? WARNER: It’s hard to point to a company and say that company is a leader. There are pockets within companies that have leadership roles, so there is a group at Pfizer, for example, that is doing phenomenal green chemistry work. There is a group at Dow Chemical. There is a group at ATMI. So there are dozens and dozens of companies that have a senior vice-president, a director of research, or research groups that embraced and successfully implemented green chemistry. Have the companies themselves embraced it? Maybe in some cases by just allowing it to happen. The pharmaceutical industry was one of the first industries to get on board, and you can understand why that is so obvious. When you think about it from one level, pharma is the only industry that does tox-tests (toxicology testing) on humans. So they’ve always understood the balance between toxicity and the benefits of a molecule. CK: Is it that big pharma is now paying attention to more than just the final product? WARNER: What would happen before is that the person inventing the molecule at the laboratory benches wasn’t aware of all the real-world manufacturing procedures. Yes, they’d do the human toxicology tests, but what about the solvents that are being used in the manufacture? On average – and I hear different quotes – for every gram of pharmaceutical product, anywhere from 200 to 1,000 grams of waste is being generated. So the proportion of waste per product is so massive that reducing waste by 10 per cent can translate into hundreds of millions of dollars in cost savings. The pharmaceutical industry is just the high-margin place with an R&D budget that can afford to do green chemistry and can see the benefits. CK: Where are you focusing your time these days? WARNER: After 10 years of Polaroid, and after 10 years (teaching) at the University of Massachusetts, I met Jim Babcock and we started a for-profit, beakers and flasks chemistry research company called the Warner Babcock Institute for Green Chemistry. It’s a 42,000-square-foot facility with millions of dollars of state-of-the-art chemical research. We’ve got about 35 scientists and what we do is invent technologies. We’re working with companies that have a great deal more experience in the field than we do and infinitely more resources, yet they’re asking us to invent. And I would argue we have an incredible success rate. CK: Why have you achieved so much success? WARNER: Not necessarily because we’re smarter or cleverer than other scientists, but because we start from the principles of green chemistry – it places us at a different starting point than everyone else and it points us in different directions. I’d argue that it profoundly enhances the innovative process within any company. And just because companies aren’t standing on the mountaintop beating their chests doesn’t mean they’re not embracing it. If a company spends tens of millions of dollars to invent less toxic materials, how can they go to the public and announce that what they were selling last year was toxic and this year it isn’t? So you’re not getting the whole picture. In the case where we see big companies having active research programs, they’re not wearing it on their sleeves. CK: What’s your own underlying motivation? Were you always an advocate of green chemistry, or did your interest evolve over time? WARNER: I am driven by an amazing amount of passion. I lost a child to a birth defect. Before that, I won every award, was on the cover of Celebrity Magazine as an uber scientist, at 19 spoke at the National Academy of Sciences, and graduated (with a PhD in organic chemistry) from Princeton in three and a half years. I got every pat on the back you could get for an industrial chemist. But lying in bed on the night of my son’s funeral I asked myself, “What if something I touched caused my son’s birth defect? What if something I got an award for caused my son’s disease?” It was a disease that no one knew the cause of, but the fact that I had no tools to even answer that question is what made me leave Polaroid and go to the University of Massachusetts to try to change the way we teach science.